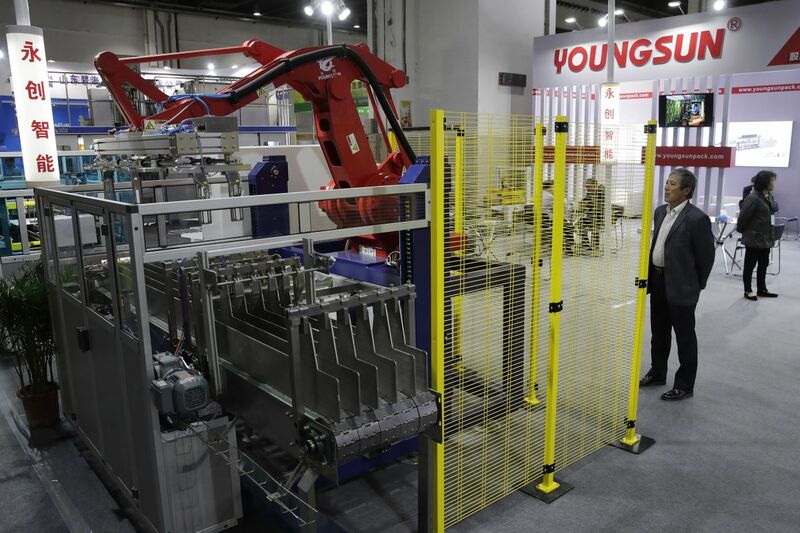 In this April 12, 2018, photo, a visitor watches a Chinese company displaying a Chinese-made industrial robot demonstration on processing soybean at the International soybean exhibition in Shanghai. China says it will narrow its trade surplus with the United States but rejects pressure to change technology development tactics seen as a path to prosperity and its rightful place as a global leader. Beijing highlighted the sensitivity of the issue with its threat to scrap deals aimed at settling a sprawling trade dispute with Washington if President Donald Trump's threatened tariff hike on $50 billion of Chinese technology goes ahead.